A jungle adventure with great features to keep you entertained. Adventure Palace mobile slot plays well on all the devices we tested it out on. The theme is nothing to shout about, but has the same great bonus features which we’ve come to expect from Microgaming slot machines. This penny slot will appeal to the adventurous out there who like animal themed games. It’s not big, it’s not clever, but we’ve seen far worse slot themes. The jackpot is also fairly decent with a 10,000 coins, or 15,000 in cash maximum win, but you’ll have to bet max for that. The gamble feature means that if you’re not hitting any free spins you can always get little thrills with gambling the wins you do get. Thankfully, as this is a fairly low volatility slot, the wins come often enough to make you budget last longer. This Adventure Palace slot is a fairly average Microgaming game, but works well for its kind, paying out little but often. Wild Symbol: The Elephant symbol will substitute all symbols, except scatter, and double any wins. Scatter and Free Spins: Scatter Palace in the Jungle symbol will win the player 15 Free Spins where all wins inside of this bonus are Tripled. 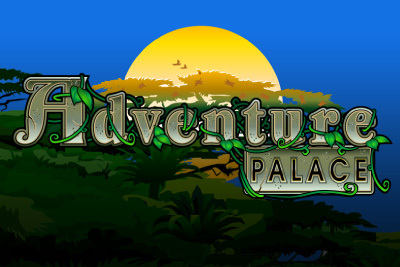 Microgaming's Adventure Palace is a fairly solid mobile slot with a lazy theme. You feel like the slots developers just decided to put some elephants in a jungle and walk away. That said, for those who like their mobile video slots a little wild and with plenty of animals we recommend you give this a few spins.